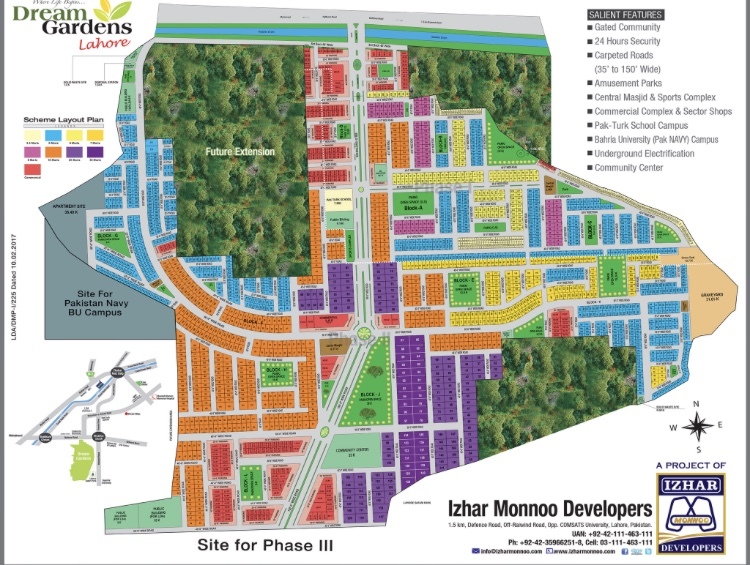 Izhaar & Monoo group have already delivered a well-planned community by the name of Dream Gardens in Lahore. Now, recently, they have launched Dream Garden Phase-2 adjacent to Phase-1. The project is available for booking in easy installments and cash payments. It offers various sizes of residential plots, constructed houses and commercial plots. The project has 5 Marla, 7 Marla, 10 Marla, 20 Marla and 30 Marla residential plots and commercial plots sized 6 Marla, 7 Marla and 10 Marla on three years easy installments. And constructed houses of various types, with sizes of 10 Marla to 30 Marla. Booking is open for all types of property including residential plots, commercial plots, and constructed houses. Booking for residential plots and commercial plots starts from 17% and rest of the amount will be paid in 3 years monthly installments. For constructed houses booking starts from 15% down payment and remaining amount will be paid in three years quarterly installments. 15% discount is also available for both plots and houses on full cash payment. 10% amount will extra charge on Park facing, corner, and facing main road plots. Dream Gardens Phase-2 is located near to Phase-1. Phase-2 is situated at main Defence Road, few minutes drive away from Thokar Niaz Baig and near to Comsats University, Bahria Town Lahore, and other major points of surrounding areas. Gated community with complete boundary wall. 24 hours security, CCTV & security guards.